Jeton #1: 1/2 Penny 1852 - Heaton Mint (Breton #720 / PC-5B2 / Courteau #084) de grade +/- AU-50 avec un problème de corrosion sur l'avers (Devant la tête du cheval) ainsi qu'un problème de ce qui semble être les résidus d'une quelconque substance, à vendre pour 13$ (Livraison incluse). 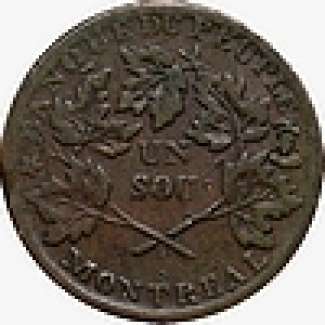 Obverse: The figure «2» points to the right of tooth. The man's left foot is half struck. The stand of letter «caNada» with its left weakly struck. In some cases with a suction mark (Die clash) to man's back, below arm. From perfect and broken dies. When broken, a wavy die crack to letter «r k & Co» on the ground close to the left of right rosette, and sometimes another die crack through letter «Of». Reverse: The Union Jack outline below letters does not extend to bottom of shield, St-Andrews cross frame below letter «tokEn» is broken in the middle. In some cases with die crack to letter «halF», to the left. Jeton #2: 1/2 Penny 1857 (Breton #720 / PC-5D / Courteau #190) de grade +/- MS-60 avec un problème important de porosité, en particulier sur une section du revers, à vendre pour 45$ (Valeur au catalogue Charlton pour le grade MS-60: 150$) (Livraison incluse). Obverse: Rosettes with inner dots. The man's left foot is lacking or hardly visible. The figure «7» is away from and a trifle higher than figure «5». A short right top serif to letter «baNk». The left rein to horse's bridle shows well. From perfect and broken dies. When broken, with a die crack from letter «banK» to mantle extending below letter «uPper». Reverse: Rope ends with one dot and a line. Light outline to Union Jack below letters. The St-Andrews cross frame below letter «tokEn» is broken in the middle. With hole to head of battle-axe. A small defect to the left of letter «bAnk». The inner balls are not connected to cornucopiae. From perfect and broken dies. When broken, with several die cracks, especially through letter «tokEn» and shield to right pineapple. Jeton #2: 1/2 Penny 1857 (Breton #720 / PC-5D / Courteau #190) de grade +/- MS-60 avec un problème important de porosité, en particulier sur une section du revers, à vendre pour 40$ (Rabais de 5$) (Valeur au catalogue Charlton pour le grade MS-60: 150$) (Livraison incluse). Oui, le Half Penny 1857 (PC-5D) est toujours disponible. Je viens de vous envoyer un message en privé.